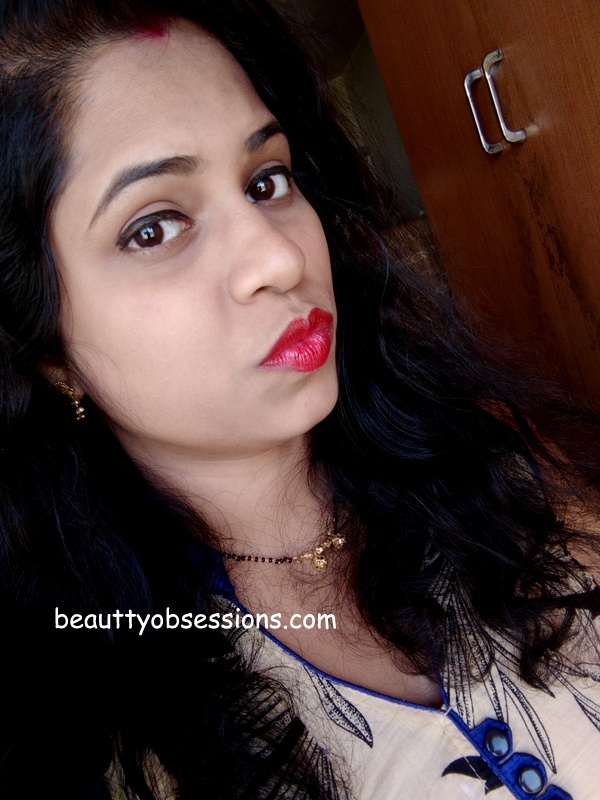 As I had promised you in my previous post , I am here with another oriflame Geordani gold iconic lipstick review i.e. the shade TRUE RED... 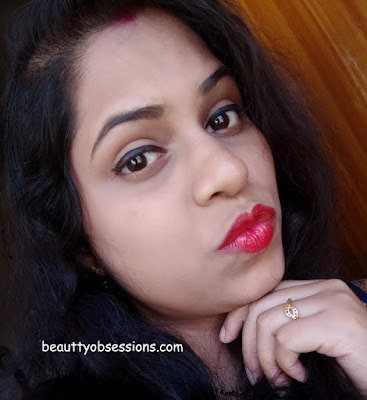 Earlier I have reviewed the shade rose petal (Read HERE) ... Let's get into the review..
PACKAGING - The oriflame Geordani gold iconic lipsticks has very royal gold packaging which looks very pretty and sturdy on the other hand. It has click-lock cap which makes it easier to carry around. The outer cardboard box gives extra protection to the bullet... You can find all details on the outer box.. 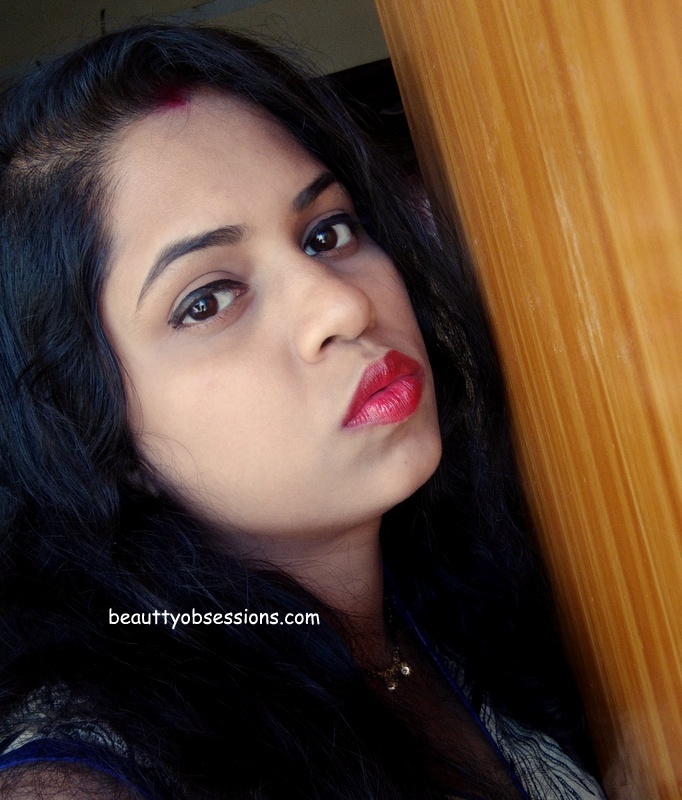 SHADE & TEXTURE - The shade name itself defines the colour of the lipstick.. Yes it is a bright red shade with warm undertones. The texture is very creamy and buttery.. I love how smoothly it glides on my dry chaffed lips. It has very sweet fragrance and same as the rose petal shade... 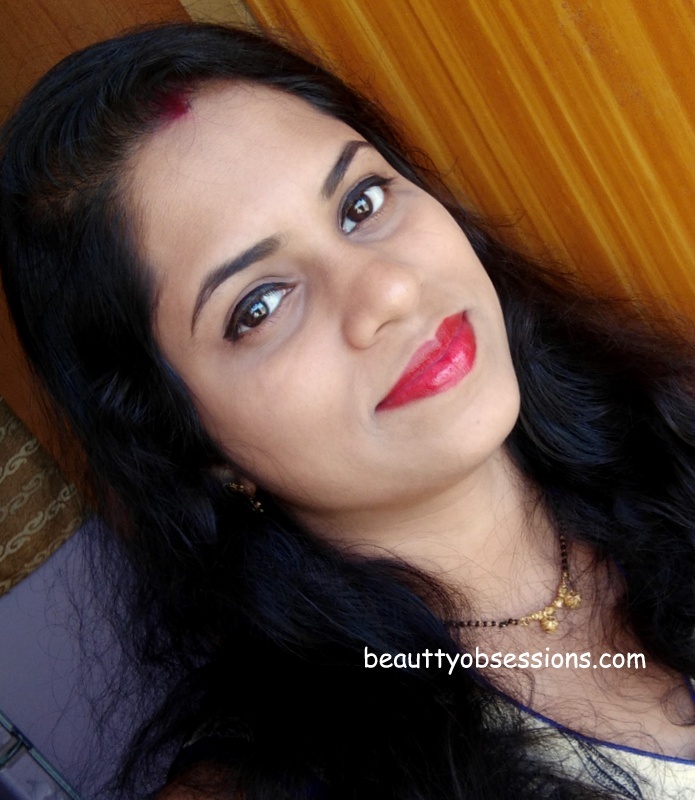 I guess all the shades of this range has same fragrance..
PIGMENTATION & STAYING ABILITY - True Red also gives a sheer coverage like the shade rose petal but the opacity is quite good as compared to rose petal... Actually my illusion was right, that the darker shades has more opacity than the lighter shades of this range. I need maximum 2swipes to get a perfect finish which is good I think. The lipstick settles into a glossy finish which minimizes the maximum staying power.. Due to creamy nature the shade transfers on things and stays maximum 5hours without any meal or snacks or nothing .. The good thing is, it doesn't stain my lips (or outer side of lips) while removing or after fading in spite of being a darker shade. ▶ Stays for around 5hours without any meal.. FINAL THOUGHT - I love this shade True Red as it is a warmer red and adds glow to my face after application. 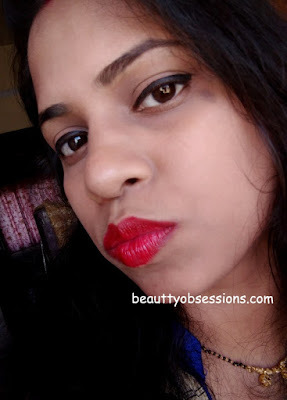 The shade is not an unique shade but if you love to add few more reds to your collection and the price isn't bothering you, then do try this one.. You will love it I am sure.. I have couple of more oriflame new launches, will review soon... Stay tuned.. This is beautiful shade but I liked the pink shade more which you posted a few days back :) cute pictures..
Beautiful packaging!! Love the shade ! You look absolutely Wahhh!! !